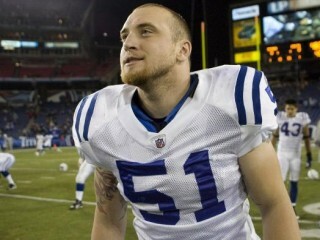 Pat Angerer is an American football linebacker for the Indianapolis Colts of the National Football League. He was drafted as the 63rd overall pick in the 2010 NFL Draft by the Indianapolis Colts. Two-year starter who opened 24 of 43 career games…had 258 career tackles, 11.5 tackles for losses, two sacks, two FF, eight passes defensed and six interceptions…started 13 games at MLB as senior…had 145 tackles, five stops for losses, one sack, two FF, five passes defensed and one interception…was First-Team All-America choice by Football Writers Association of America and Football News and earned Second-Team honors from Associated Press and Walter Camp Football Foundation…was consensus First-Team All-Big Ten choice and one of five finalists for Bronko Nagurski Award…averaged 11.2 tackles per game, ranking second in Big Ten and fourth in NCAA…started 11 of 13 games as junior…was Second-Team All-Big Ten choice…had 107 tackles, 6.5 stops for losses, one sack, three passes defensed and five interceptions…appeared in four games as sophomore after shifting from WLB to MLB…had one tackle…saw action in 13 games at OLB as freshman…had five tackles…was redshirted in 2005…majored in health and sport studies. Full name is Patrick Aaron Angerer…born in Bettendorf, Iowa…attended Bettendorf High School…earned all-state and all-conference honors final two seasons…team captain holds school records for tackles in a game (25), season (197) and career (344)…also had 17 career sacks…helped team to Class 4-A state title as senior…earned three letters in football, two in wrestling and soccer and one in track and field…helped team to state title in soccer as senior…single…resides in Bettendorf, Iowa.